My daughters keeps me busy each year with themed homemade cakes. It is a lot of fun to make them and figure out how the design is going to work. This year was Alice In Wonderland. 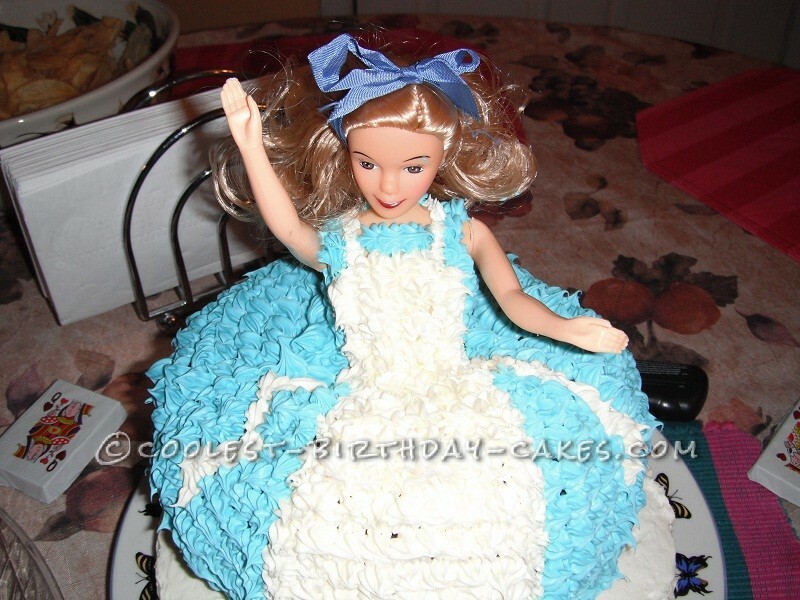 I used a doll that she had that resembled Alice and wrapped the doll in saran wrap to protect it. Next I made a store bought cake into a round flat cake as a base and iced it with white icing. I made another store bought cake into a sort of upside down bucket shape – like a sandbox bucket. I bored out the center of the “upside down bucket” and put the doll in it. The bucket shape held the doll in place nicely. Next I mixed up some homemade icing, using powdered sugar, water and little vanilla extract. 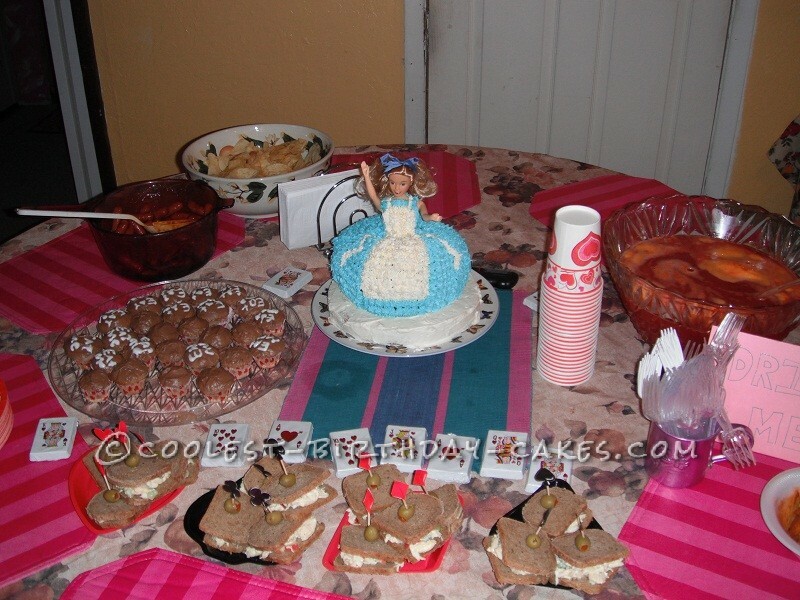 I added food coloring of blue to make Alice’s dress and white to make Alice’s apron. Using an icing sleeve and flower nozzle I made dots of icing row by row in blue. When I came across where the apron was I made a white dot with a separate icing sleeve and nozzle. This does take some time to fill in the detail with icing but the effect is pretty cool. 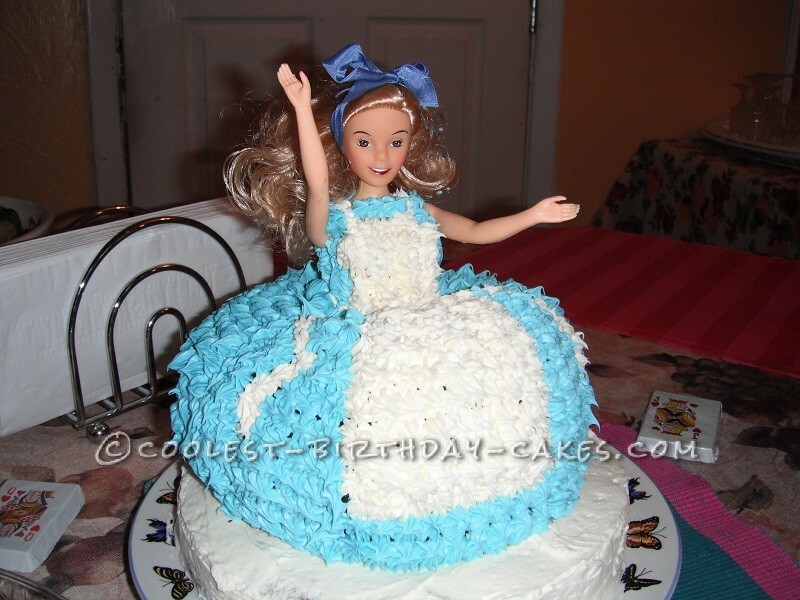 I started at the bottom of the cake and worked up until the icing became the neck line and sleeves of Alice. My daughter was so very happy with her cake and all the family around had great things to say about it. We topped off the table with “eat me” cupcakes and “drink me” punch as in the second picture. I didn’t know how this was going to work out but by the reaction of the family and my daughter I think it was a winner.